Even though there had been rumours before, Rise As God still came as a surprise for me. A sweet one, to be exact. As a gift for fans before their hiatus due to military enlistment, TVXQ surely have satisfied Cassiopeias with this album. Tense was a musically solid album, so I think it’ll be tough to surpass it. Rise As God may not have the unity like Tense does. It’s something different, and it’s indeed another progress for TVXQ’s music. The album begins with Vertigo, a sleek, mysterious song with haunting bass sound. It doesn’t sound like a song from a K-pop group, more like a track taken from a British indie rock album. I personally love this kind of dark song for TVXQ. Next we have the two title tracks, Champagne and Rise As One. The two songs show Yunho’s and Changmin’s different personalities and abilities. Champagne is funky and groovy, a summer tune. It really represents Yunho’s bright personality. Meanwhile, Rise As One starts with acoustic guitar before transforming into an energetic dance anthem. My guess that it would be a heavy rock song was wrong, but Rise As One is another achievement for Changmin. His voice is perfect for this song. Again, he amazes me with the versatility of his voice. 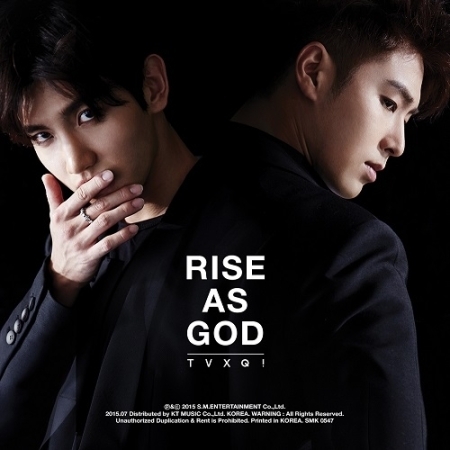 We have more solo songs in Rise As God, Apology for Changmin and Komplikated for Yunho. Apology is a smooth R&B track, not exactly my genre to be honest. Yet it seems to me that Changmin always manages to tackle any genre stunningly, and he does it again with Apology. But actually what amazes me more is Komplikated. I never thought that Yunho’s nasal voice would be suitable for this kind of clubbing dance track. Seulong, you have a new contender here! As a fan of TVXQ, this album satisfies my thirst for TVXQ’s Korean releases, even more than I expected. Each track is a gem and immaculately produced, but if I have to choose my top 5 songs, they would be Vertigo, the two title tracks, Top of The World and Lucky Star. Top of The World is my jam for its groovy beat and positive mood, and their voices in this song are such a feast for my ears. If they could promote a song together, I would vote for Top of The World. Lucky Star also serves well as the closing song. It’s a rock track that again demonstrates TVXQ’s flexible singing skills. When they sing the line “I’m your lucky star,”, I can’t help but thinking that yes, they’re our lucky stars. Besides those songs, we also have the cheerful, jazzy Smile and Everyday It Rains that is, of course, a fitting song for rainy days. Even though we know it’s temporary, it’s never easy to say goodbye. One thing I’m grateful about is that TVXQ bid farewell with their music, with an album that I will definitely listen to again and again while waiting for their prodigious comeback later in 2017. TVXQ were once broken and bent, but then they refused to surrender. This time, with Rise As God they rise again, and I hope they will never stop rising. Categories: music, review | Tags: DBSK, K-pop, Rise As God, TVXQ | Permalink.